I’m a pretty spontaneous guy and already am easily distracted by shiny, expensive objects, so when it comes to focusing on the logistics of running the photo business, I kind of freak out and forget some things — but did I need something to help out with that? I’ve always wanted something, I just didn’t know that I needed it though. There are plans for shoots, changes to shoots, more shoots to book along with shoots that cancel, haven’t paid or I haven’t delivered on top of those I haven’t had a chance to address at all. So not only was I losing time over my own administration, I was losing business with those I haven’t even contacted — and that’s all taking away time from the marketing and shooting that I’d rather be doing. Kind of sad, isn’t it? Maybe you’re like me, hopefully not, but if so — wouldn’t it be nice if there was some software that could help organize all that and tidy things up? And now that I think of it, even if you’re not absent minded and easily sidetracked like me, if you’ve got a growing business with more and more clients, you’ll like this too. Bloom.io is a CRM software — customer relationship management software — but it is also a hair loss product, as it will reduce the amount of hair loss one would have without software like this. *not proven, but sure is likely. Bloom.io is that helpful tool that can help bring all the loose ends of your photo business (or any freelance business), all to one place so you can tie things up all neatly and save time on all that boring admin stuff — like typing out emails, explaining photography packages and prices, sending out contracts and following up on leads. Just look at that professional package page! You can start setting up a hosted website with them to funnel traffic or embed contact forms with available dates with a calendar view into your current website to book, then view stats and conversion rates, offer live chat to visitors to your site (as if you have time for that, but sure does sound good on paper — I’d love to randomly pop up and scare someone with love on my website), send estimates to potential customers and send invoices to existing customers. You can create workflows to maintain your customers (kind of cool — like did I do all the steps I needed to for this shoot? Scout? Book location? Book makeup? Book hair? Charge batteries? Send welcome email? etc. 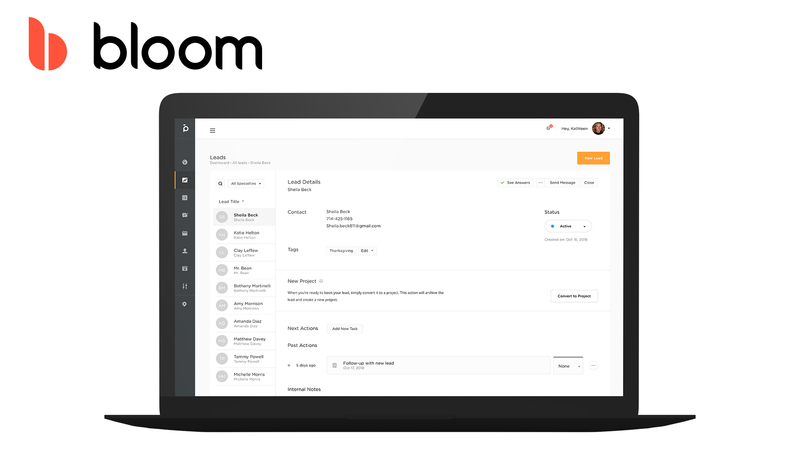 ), deliver images to customers who’ve paid you and manage all your contacts. It’s quite the package! But wait — there’s more! So if you want to manage your business like how Peter Hurley takes headshots or how Joel Grimes crafts composite or how control the commercial photography world like Erik Valind — which is obviously like legends — you’ll want to use this. Oh, and they do use Bloom.io, imagine that.